Ready to make your own pottery? Let's get started! 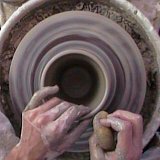 In this online class I'll take you through 10 steps (8 videos) to make your own pottery. This page is an overview of the steps. To see more detail on each step click on the text links below. Keep in mind that pottery wheel throwing is like learning to ride a bike. What seems impossible at first will soon become second nature to you. 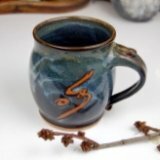 Once you learn how to make your own pottery using this online class you'll never forget. Just follow these steps and keep trying and you'll be making beautiful handmade bowls, mugs, and vases in no time. Also, visit my Pottery Store for recommendations on clay, wheels, and other pottery supplies. In 6 quick minutes it will take you from holding a lump of clay to creating a finished pot. Click on the links to the other pages where you'll find more detailed videos about every step. The key to good pottery is good clay. If your car was built with rusty metal it would fall apart. The same goes with clay. Learn how to prepare your clay for throwing. 2: Center the Clay on the Wheel. Centering is an important skill to master in ceramics as every other step relies on it. Learn how to center clay on the wheel. Centering is one of the hardest parts, so if it isn't perfect right away, that's okay. Once you perfect centering you have the foundation of making your own pottery on the wheel. Now that the clay is centered create a hole in the center of the form. Pull the clay open to make a shallow bowl (see video above). Now that you can see into the form you'll want to make a good floor for your pot. Very slowly squeeze the side of the pot between your thumb and fingers. The clay will bulge slightly as you begin to pull the clay up through the walls of the pot. If your rim is wobbly at this point, take heart! Using the needle tool, cut the extra clay off the rim to even it out. Way to go! You're almost there! Learn a few tricks for finishing the base and cutting your pot off the wheel. Lift your pot off the wheel and let it dry until it is leather hard. Leather hard is just what it sounds like. The pot can be gently handled. The stickiness is gone from the surface. If the bottom is still a little wet it's a great time to finish the pot. Using your fingers or a damp sponge smooth any irregular edges. You can also carve your name in the bottom! If you want to get extra fancy with your pot you can learn to trim the bottom. You can trim a foot into the bottom giving your pot a more professional look. Congratulations! You're finished! 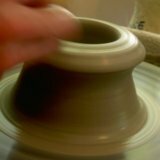 You just learned how to make your own pottery on the wheel. Give yourself a big muddy pat on the back. Keep in mind that on the first try most people end up with something like a lumpy ashtray. If you've accomplished that much, you're doing great. Once you've cleaned the mud off of the ceiling, the dog, and the neighbor's car, return to the wheel. No matter what your first few pots look like, keep going. 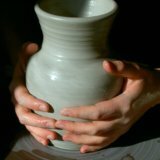 Get a fresh lump of clay and go through this lesson on how to make pottery again. Each time you'll get better and better. Soon you'll be able to make your own pottery mugs, bowls and vases. Thanks for letting me be your teacher and Happy Potting.